In the autumn of 1913, Roger Fry and the French painter Henri Doucet (1883- 1915) had a short painting holiday in and near Avignon in Provence. They were at the small town of Aramon, south-west of the city, when they discovered a valley, edged by hills, that forms the subject of this screen. In 1919 Fry revisited the area and was happy to find again this 'wonderful valley' (letter from Fry to Bell, 6th October 1919, in D.Sutton (ed): Letters of Roger Fry, London, 1972, vol. II, p.459). A fortnight later he writes to Bell again: 'You remember the screen I painted from memory of my visit to it (the valley) with Doucet'. When he writes 'from memory' he may well have had by him some pocket sketchbook with a small drawing and some annotations, as was often his habit. In effect this screen is Fry's largest 'easel' painting and consistent with his landscapes of 1912-14 which are some of his strongest paintings, especially Farm-buildings, France (University of Hull Art Collection) painted on the 1913 visit to Avignon. All such works are characterised by an insistent geometrical angling and faceting of the forms and a range of warm colour, particularly olive greens, ochres, dusty pinks and burnt umber. Here too we have the hatching contours (in the trees, for example) derived from some of Picasso's works of 1908-09. 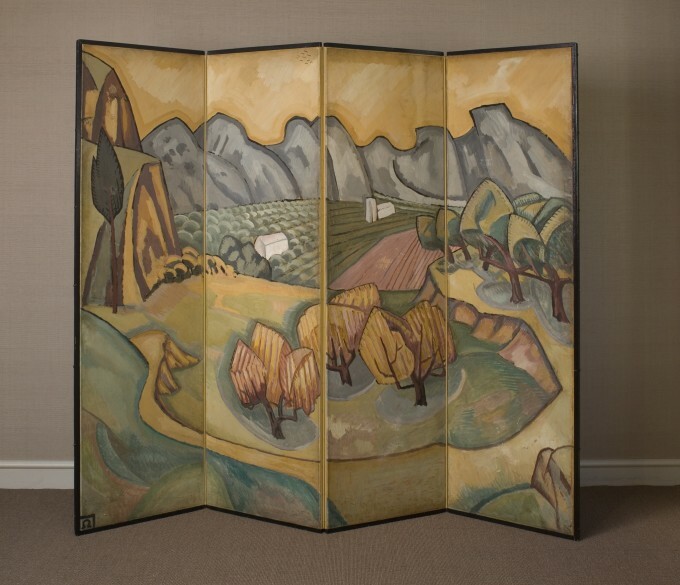 As far as is known, this is Fry's only extant painted screen made for sale at the Omega Workshops. "...the long low tier of bookshelves which had wooed me so often from my work, the black framed etchings of Nevinson and Wadsworth , the two watercolours by Prout, the patterned tiling of the fireplace, and that dazzling screen by Roger Fry which I had bought at the Omega workshop sale with such thrilled misgiving and which has since taken its place so unobtrusively against a background of many coloured volumes;.."
Evelyn Waugh also refers to the screen in the opening chapter of Brideshead Revisited. Charles Ryder, the narrator, remembers the furnishings of his college room at Oxford as having included (along with a print of Van Gogh's Sunflowers): ' a screen, painted by Roger Fry with a Provencal landscape, which I had bought inexpensively when the Omega workshops were sold up'. Inevitably, alongside his social development, Ryder's artistic taste soon moves from Omega, through to the Pre-Raphaelites and on to the Baroque.